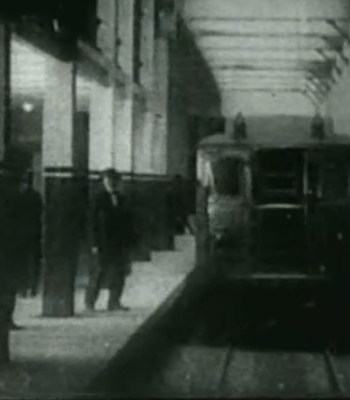 NYC SUBWAY OPENS--At 2:35 on the afternoon of October 27, 1904, New York City Mayor George McClellan, Jr. takes the controls on the inaugural run of the city's innovative new rapid transit system: the subway. While London boasts the world's oldest underground train network (opened in 1863) and Boston built the first subway in the United States in 1897, the New York City subway soon became the largest American system. The first line, operated by the Interborough Rapid Transit Company (IRT), traveled 9.1 miles through 28 stations. Running from City Hall in lower Manhattan to Grand Central Terminal in midtown, and then heading west along 42nd Street to Times Square, the line finished by zipping north, all the way to 145th Street and Broadway in Harlem. On opening day, Mayor McClellan so enjoyed his stint as engineer that he stayed at the controls all the way from City Hall to 103rd Street. At 7 p.m. that evening, the subway opened to the general public, and more than 100,000 people paid a nickel each to take their first ride under Manhattan. IRT service expanded to the Bronx in 1905, to Brooklyn in 1908 and to Queens in 1915. Since 1968, the subway has been controlled by the Metropolitan Transport Authority (MTA). The system now has 26 lines and 468 stations in operation; the longest line, the 8th Avenue "A" Express train, stretches more than 32 miles, from the northern tip of Manhattan to the far southeast corner of Queens. Every day, some 4.5 million passengers take the subway in New York. With the exception of the PATH train connecting New York with New Jersey and some parts of Chicago's elevated train system, New York's subway is the only rapid transit system in the world that runs 24 hours a day, seven days a week. No matter how crowded or dirty, the subway is one New York City institution few New Yorkers—or tourists—could do without. Note: George Brinton McClellan, Jr., (November 23, 1865 – November 30, 1940) was an American politician, statesman, and educator. The son of American Civil War general and presidential candidate George B. McClellan, he served as Mayor of New York City from 1904 to 1909.